[tweetmeme]This guest post was written by Jason Acar. Jason is currently a content writer for MyCamera.co.za. He has extensive journalism experience and a keen interest in photography. Many budding photographers still debate whether to buy digital cameras, or opt for older analogue film models. The truth is, technology has advanced so much that digital cameras can achieve just about anything you want when it comes to photography. 1826 - Nicephore Niepce took the first permanent photograph in history. Although there may have been other photographs taken during this time, the photograph of the exterior of his home is the oldest photo on record. He took the image using a camera obscura and a sheet of pewter coated with bitumen of Judea, which hardened permanently when exposed to light. Capturing the image took eight hours. 1839 – William Fox Talbot invents the positive/negative process. Although essentially a negative photograph, which he dubbed as the “photogenic drawing process”, he streamlined the process a year later and renamed it the calotype. This effect remains popular today. 1854- André-Adolphe-Eugène Disdéri became known for the introduction of the carte de visite (French “visiting card”). Disdéri’s rotating camera could reproduce eight individually exposed images on a single negative. 1861 – Renowned physicist and mathematician James Clerk Maxwell took the first ever first colour photograph. He created the image of a tartan ribbon by photographing it three times through red, yellow and blue filters before combining them into one colour image. 1868 - Louis Arthur Ducos du Hauron of France became a pioneer in the field of colour photography. Using additive (red, green, blue) and subtractive (cyan, magenta, yellow) methods, he turned colour photography into an art form. He would go on to patent some of his methods, while one of his most famous, and earliest, photos is a landscape portrait of Southern France, taken by the subtractive method in 1877. 1887 - Gabriel Jonas Lippmann, a physicist and inventor, landed the Nobel Prize in 1908 for using the phenomenon of interference to reproduce colours on a photographic basis. This later became known as the Lippmann Plate. 1888 – The Kodak No. 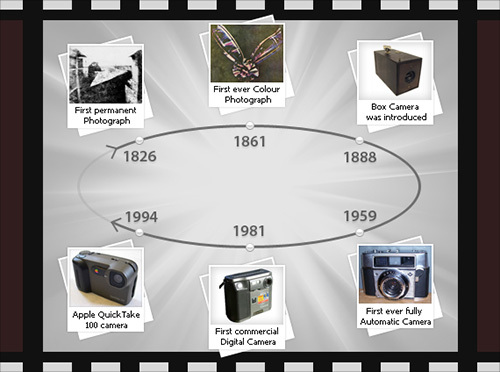 1 Box camera was introduced, allowing the mass market to finally try their hand at photography. Once one hundred photos had been taken, owners would ship the camera back to Kodak and have the images printed at a price of $10. 1900 – If the No 1 Box introduced the average Joe, the introduction took things a step further. This camera made low-cost photography popular and introduced the world to the snapshot. This basic cardboard box camera offered simple controls and a price tag of just $1. 1902 - Arthur Korn discovered practical photo-telegraphy technology, meaning that images could be sent via wires. Europe quickly adapted the technology, sending photographs locally by 1910. Eventually inter-continental delivery was done by 1922. 1923 - Doc Harold Edgerton introduced the xenon flash lamp and pioneered strobe photography. This paved the way for improved portrait pictures, as well as photographs in areas with little or no light. 1936 - The world was introduced to the first single-lens reflex (SLR) camera. This 35mm SLR camera was named Ihagee Kine-Exakta and made in Germany. 1948 – Edwin Land, who founded the Polaroid Corporation in 1937, released the instant film camera in this year. This device would become their most popular product line for decades to come. 1959 – There was a time when AGFA was close behind Kodak as a leader in the world of photography. It was at this point that the company introduced the first ever fully automatic camera, the Optima. 1972 - The rise of digital happened a lot earlier than many people realise. Texas Willis Adcock, a Texas Instruments engineer, actually created a design for a filmless camera and applied for a patent in 1972. Unfortunately, nobody knows if it ever came into existence. 1973 – Fairchild Semiconductor paved the way for digital imaging, releasing the first integrated circuit, just ahead of Texas Digital. 1975 –Steven Sasson unveiled the first digital camera using CCD image sensor chips. This groundbreaking device took black and white (recorded onto a cassette tape) and offered a resolution of 0.01 megapixels. The first image ever captured on this prototype took 23 seconds to record. 1981 – Sony released the Mavica, the first commercially available digital camera. Although this was a revolutionary product in the photographic industry, it was actually digital video recorder that took freeze frames. 1986 – Leading photographic company, Kodak, brought out the first megapixel sensor, which was able to record 1.4 million pixels. By 1991, the company had created the first professional digital camera system (DCS), a Nikon F-3 which was targeted at photojournalists. 1994 – Only a select few were able to enjoy digital technology up until now. Apple introduced the Apple QuickTake 100 camera in February 1994, a digital camera aimed at the average Joe which was able to work with a home computer. Others soon followed including the Kodak DC40, Casio QV-11 and the Sony Cyber-Shot. 2006 – Digital photography steadily edged out the use of a film camera, so much so that Polaroid announced that it was halting production on all of their instant film products. 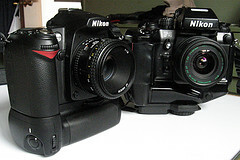 2010 – Digital cameras are introduced monthly, if not weekly. Each with more advanced features, better quality picture quality and enough on camera space for thousands of images. To top it off, printing of images is quick, cheap and never wasteful as you select the images you want without have to deal with overexposed or dud images. This guest post was written by Jason Acar. Jason is currently a content writer for MyCamera.co.za. He has extensive journalism experience and a keen interest in photography. This entry was posted in Features and tagged camera, digital, Film, history, photography on November 23, 2010 by Brian Auer. Earlier this month, I wrote a post on the film blog about the different types of film photographers and ran a poll asking the readers to categorize themselves. It was no surprise that we had zero “film haters” chime in ;). I want to take a step back, look at the question in a broader sense, and open it up to a wider audience (you guys). I’m fascinated by the film vs digital thing, and I see a lot of people doing both (but that could just be the crowd that I associate with). So what I want to learn here, is what percentage of the Epic Edits readers shoot film, digital, or both. For those who know me even a little bit, you know that “I Do Both!” Give it a few years and I might get rid of my digital stuff though… j/k, calm down. I’ve been noticing a renewed interest in film photography over the last year or two, but I’m wondering if it’s just me or if it’s really happening. What do you guys think? Are people coming back to it? Or am I delusional? Also, don’t forget to check the results from the last poll: How often do you shoot? Looks like we have a pretty good mix of votes. This entry was posted in Reader Poll and tagged digital, Film, photography, poll, question on June 30, 2010 by Brian Auer.